A Weekend With a Bang! 4th of July is summer in every little detail. It means to me, warm weather, freedom, free time, barbecue, close friends or family, picnics, potlucks, sunshine, leisure. Although for the second summer in a row I am not able to partake in my traditional family fun-filled Fourth of July (wow lots of “f”s) I was able to celebrate in a similar fashion. I spent Saturday at Alki Beach for a Meetup-sponsored BBQ. Alki beach has stunning views of Seattle over the water and the 75 degree weather and bright sun made it truly awesome. We grilled, played beach volleyball for a longgg time, and had a bonfire. 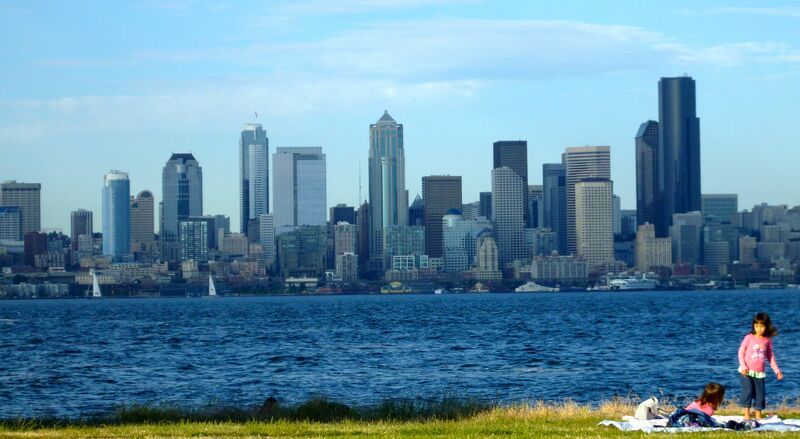 View of downtown from Alki. I can spot my office from here! Sunday was my supreme leisure day. It started with the Lululemon yoga class, then reading in a coffee shop with the rain falling outside, and then went to the Paramount Theater with friends to watch a showing of The Westside Story with the free tickets I got from the Starbucks Freebie Friday promotion. I didn’t go for the movie, I went to see the remarkable theater. Monday I went for my first Washington hike. 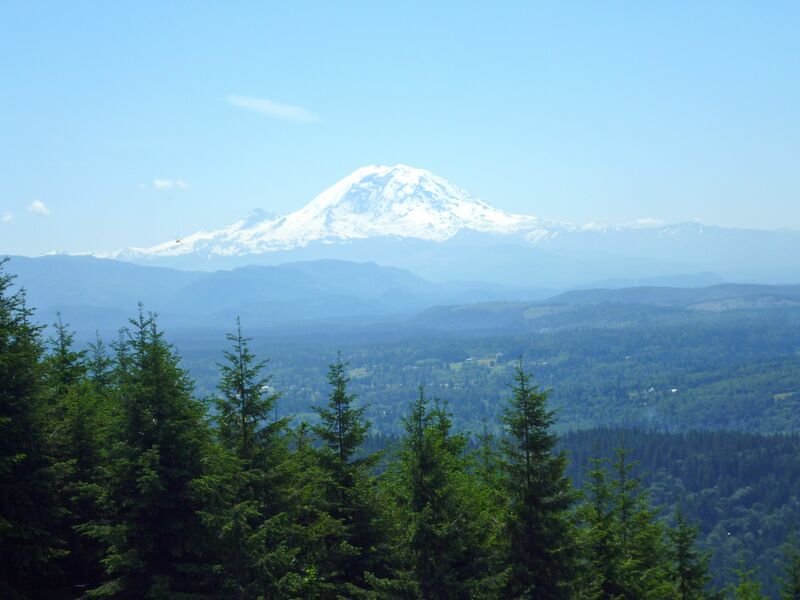 Headed out to Issaquah to Tiger Mountian for a short (1.7 mile) but steeply inclined moderate hike. It was the perfect distance and intensity and the summit presented cool views and I got to watch several paragliders take off into the sky which was super crazy. 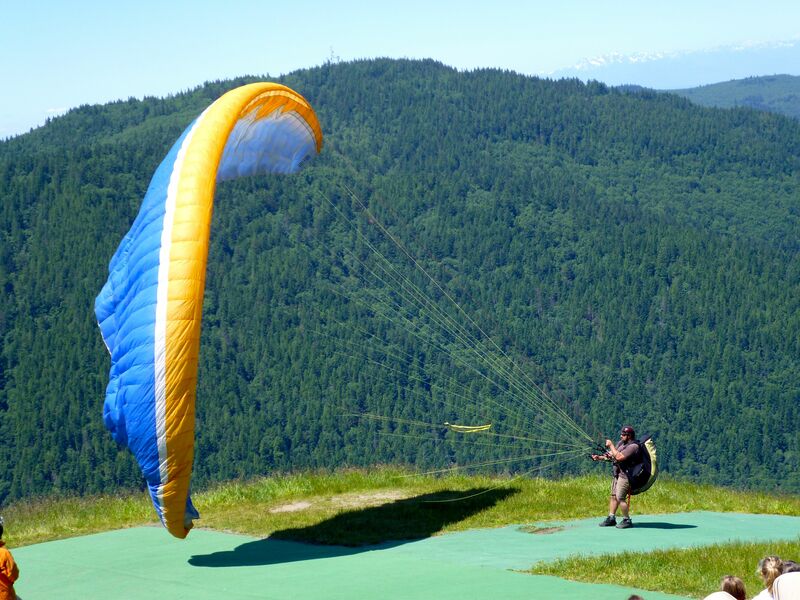 When we reached the base it was amazing to see about 20 gliders slowly coming down. It was like watching kites but 100x cooler and I had never seen anything like it before. Mt. Rainier from Tiger Mountain in Issaquah! 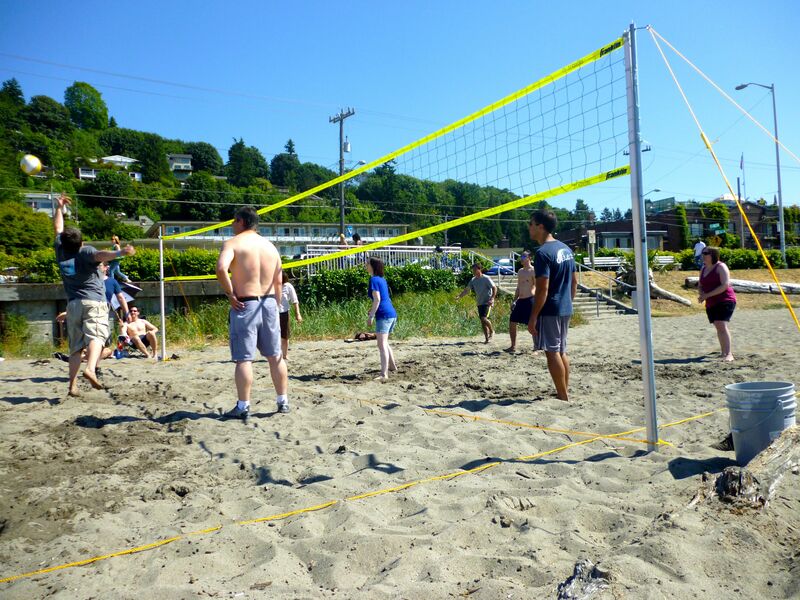 Monday night plans included going to Golden Gardens (another beach located on the west side of Ballard). I went with a coworker to hook up with her friends but they were packing it up and heading back to their place. I was bummed not to grill out at the beach because I found I liked this beach (the sand) better than Alki. We still got to eat grilled meats (pipi kalui, a Hawaiin jerked beef, yum! ), fruit salad, and potato salad. Wine was consumed and then we set off for Gasworks Park to take in the fireworks from the banks of Lake Union. Spectacular but loads of people. It did remind me of Boston!! 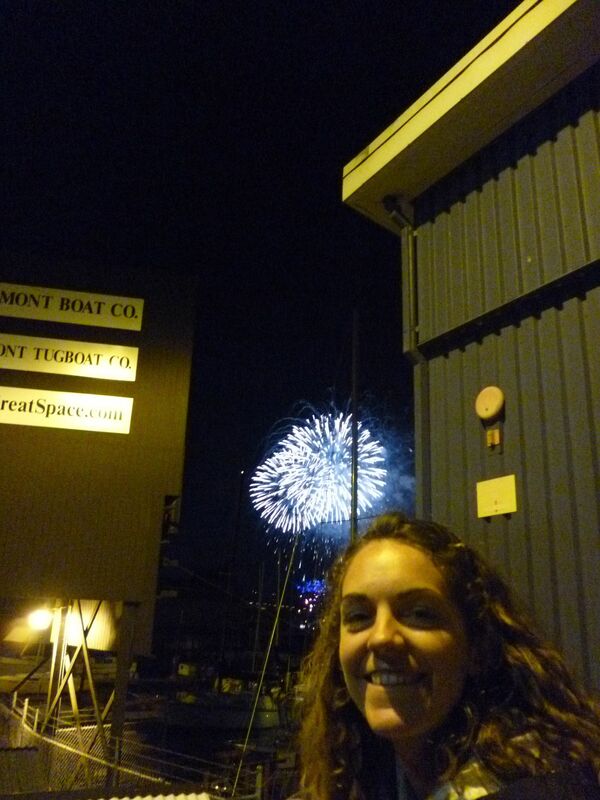 Gasworks fireworks on the 4th! As much as I enjoyed my holiday weekend this is a very difficult weeked to not think about being back home and how I regret not being able to see my family and enjoy my cottage like the golden days. 😦 Sigh. Other brief news: I could be a permanent guest at Ashley’s apartment. I really enjoy hanging out there and sleepovers. Happy hours are still great in my book. My grill works really great! I went to a casual dinner party Thursday night for all the volunteers for the Ballard Seafoodfest, which is next week, and which I am volunteering at. It was unbelievable and unexpected with all of the food that they generously had donated for all of the volunteers. I got to try a blackened salmon slider from Ballard Brothers, pizza from Vivaces, hummus, tzatiki, and babaghanoush from a local middle eastern place (must seek out because it was phenomenal tasting), and a variety of fruits, veggies, and wine. And I discovered another great Thai place, this time in the University District and then went to a great classy jazz place called Lucid on Friday night which I thoroughly enjoyed. Oh and the bang of the weekend came not from the fireworks but from a minor blip driving Ashley’s car in West Seattle. It looks like I am going to be down $1000. Not a great way to start the weekend at all but I am trying to get over this experience and just get it taken care of. It was not my best moment and just cannot believe my luck with friend’s cars. I hate cars! Have I ever said that before? The only thing they are good for is to eat my money. I also blame the streets of West Seattle which should seriously, seriously be one-way streets.